The Amplified HumPRO™ Series Long Range RF Transceiver Module is the easiest-to-implement solution for simple long range wireless connections. Unlike other pre-certified modules, it has a best-in-class real-world range of over 12.9km (8 miles) with sustained data rates 200 - 1,500 times higher than competing protocols. The Amplified HumPRO's pre-compiled software supports many common use cases out-of-the-box at 50% of the total cost of implementation of comparable solutions. Designed to transmit digital data across a long-range wireless link, the module is a completely integrated RF transceiver and processor. With a built-in frequency hopping protocol that manages all of the transmission functions, no on-chip programming is required. Simply configure a few registers with a binary command set. The latest software included in the HumDT, HumPRO and Amplified HumPRO Series Master Development Systems. 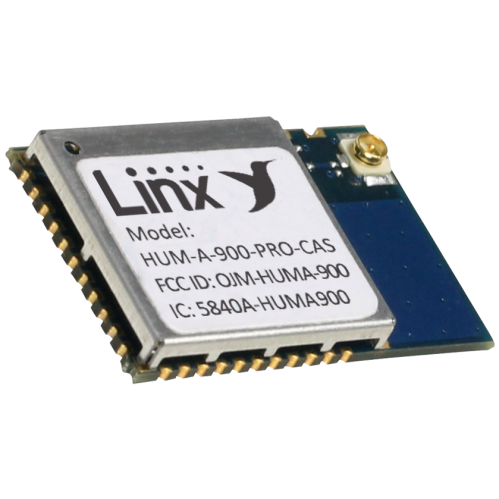 Demonstrates the functionality of the Linx wireless data transceiver modules.